It’s no secret that subtitling services can be great for SEO. In the eyes of Google and other search engines; subtitles equal text; text equals indexable data and ultimately, indexable data equals higher rankings! Online subtitling for websites can encompass a huge range of video and caption styles, as well as formats. We’re here to work through the different types of website captions available to you. When it comes to e-learning, there are a number of benefits to adding subtitles to your captions. Besides the obvious advantage of better search engine optimisation, captions are also proven to improve learning outcomes. E-learning subtitles can aid learning by improving focus as students absorb information both visually and through audio. Captions can also help to improve focus over longer periods of time where it would otherwise be easier to ‘zone out’. Capital Captions offer e-learning subtitling services for a range of different websites including HTML5 and for a variety of platforms including subtitles for Adobe Captivate. Online Subtitling for Websites can help ensure video content appeals to an international audience. There are a number of options available for international website subtitling. These include translating subtitles and adding them as closed captions to video content, so foreign viewers can select the appropriate language before viewing content. This option is perfect when videos are published in one language and via one domain (For example, .com or .co.uk), but intended to appeal to a wider international audience. Another option is for online subtitle burning. Unlike with foreign closed captioning, burned in subtitles display permanently on a video in whatever language they display. They cannot be turned on and off, or amended by a viewer. For this reason, to publish videos with subtitles burned in for multiple languages requires a video to be uploaded to a site multiple times, simply with different captions. Whilst this can be time consuming and take up a lot of space, it can also increase viewer engagement when a website simultaneously uses multiple domains ( For example, .de, .fr, .es and .co.uk). A viewer that visits a .de version of a website will immediately see a video with German subtitles without having to scroll through a list of languages to allow accessibility. A lot of video advertising viewed online nowadays is actually viewed with the sound off. Pop-up advertisement, webpage sidebars and even Facebook timeline advertisements and posts will display as default with no sound. If you want site visitors to actually understand and access your advertisements, adding subtitles to your videos is an absolute must! Popular video sharing sites such as YouTube and Vimeo are often viewed by web users on-the-go. For this reason, many videos are often viewed with no sound. Automated subtitles can be adequate in cases where there is one very clear speaker and little to no music, accent or sound distortion. YouTube subtitle fails are notorious. Voice recognition and automated subtitles can leave you with captions riddled with offense, embarrassing or hilarious mistakes. Avoid having your videos tainted by bad subtitling by making sure you add your own high quality online subtitles to your YouTube, Vimeo and Facebook subtitles! 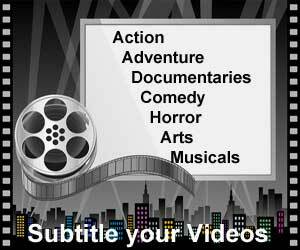 So there you have it, adding online subtitling for websites is the best way in which to attract larger audiences to view your online videos. If you want to get the most out of your online content and open up your content to a far greater worldwide audience, adding subtitles and especially translated content into many languages will do just that. If you would like more information about our foreign translation services or for a direct quote, contact us today.